Do you own your house or does your house own you? That's the question Oliver and Cera of British Columbia asked themselves a few years ago. As newlyweds living in a traditional home, they knew their focus had shifted. They were spending less time emphasizing adventures and more time on pursuing ways to furnish their home. Their answer was to move into a tiny home and get back to the basics of what they valued: freedom and simplicity. 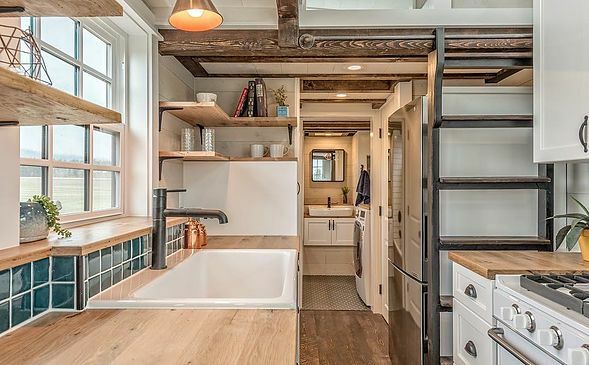 Their passion for tiny home living became a passion to help others achieve this same dream. 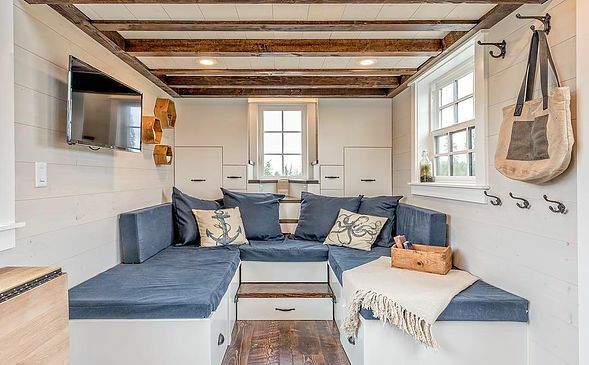 They created Summit Tiny Homes, where Oliver's talented craftsmanship brings Cera's stunning designs to life. 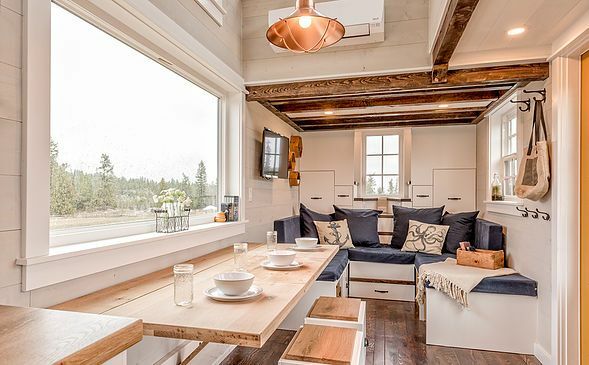 This 375-square-foot home is called the Westcoast. 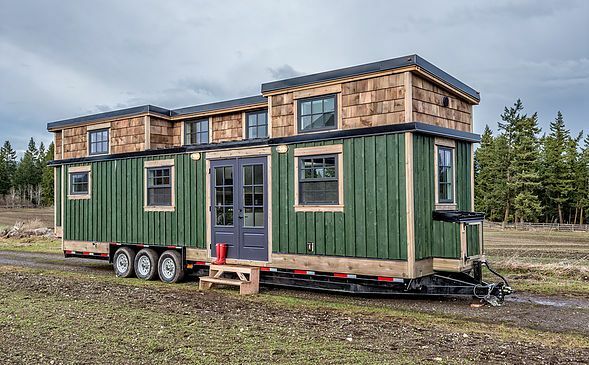 It was built for a family of four and sits on a 34-by-8.5-foot trailer. Its cedar shingles and cedar board and batten siding give it the coastal look that inspired its name. Summit Tiny Homes is now the premier tiny home builder in Okanagan, British Columbia. It goes to show that when you set the right priorities, the benefits can stretch beyond your imagination. The interior of the Westcoast is an example of the couple's exquisite style and craftsmanship. The wide window allows natural light to pour into the room where it highlights the white shiplap walls and rustic wood beams on the ceiling. The custom-built couch opens up to become a guest bed, and storage is plentiful under the couch and on the attractive wall hooks. Look closely and you'll see the hidden stairs that extend behind the couch and up to the sleeping loft above. A long oak table easily accommodates a family meal and folds down when it's time to play after dinner. The table can actually be folded up into three separate sections to provide a smaller table. When the stools are not in use, they rest in their spots underneath the couch. 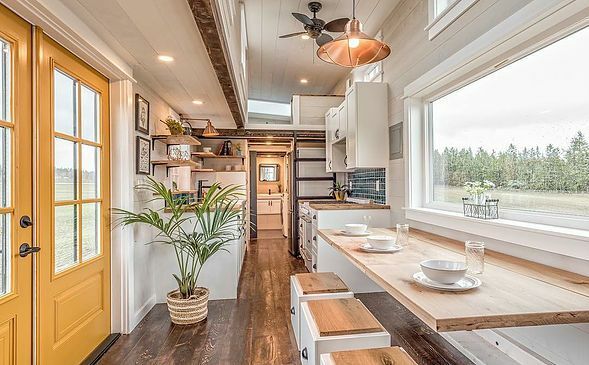 The clean lines and colors in the kitchen represent the simplicity of tiny home living. No space is wasted and everything is within reach. 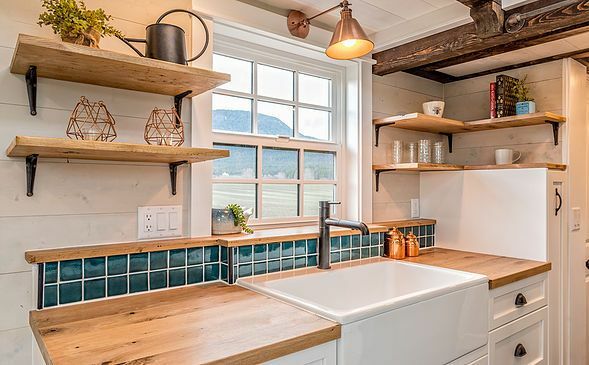 The open shelves give the space an airy feeling, and the light oak countertop is a natural complement to the enormous farmhouse sink. 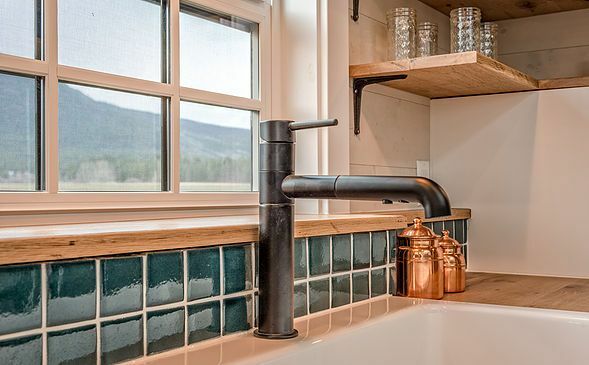 The green tile backsplash and wood trim reflect the colors and textures of the outdoors. 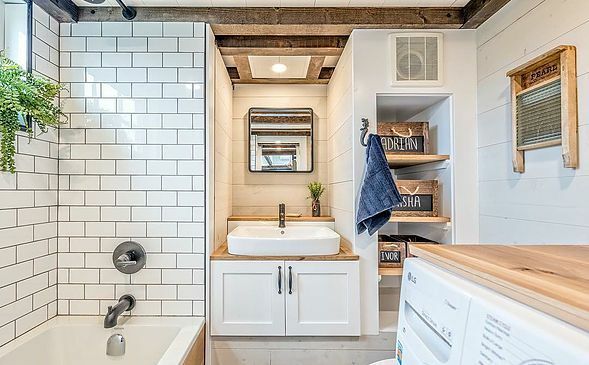 The modern faucet is an example of how style and luxury are not compromised in this tiny home. 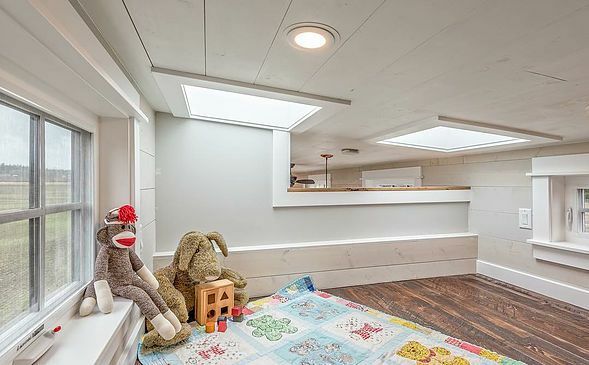 Climb a few steps up the ladder in the kitchen and you'll reach the master bedroom loft, which is naturally lit by windows and a skylight above. Remember the hidden staircase behind the couch downstairs? The steps lead to this second loft bedroom. 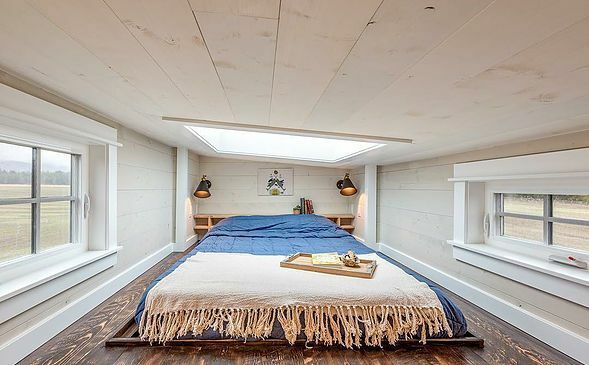 There's enough room for two small beds and a great view of the night sky from the windows and dual skylights. 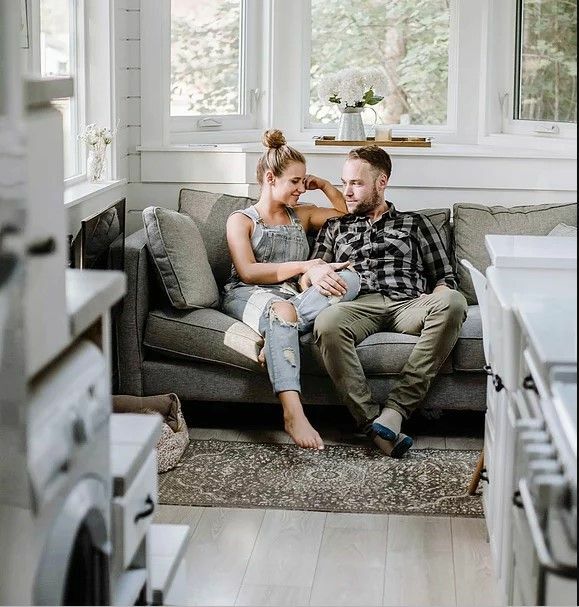 When Oliver and Cera decided to embrace the tiny home lifestyle, they redefined their lives to emphasize simplicity, purpose and beauty. Once you step into the Westcoast, there's affirmation all around that simple living can be absolutely beautiful.